In late July, DogTime reported on Turbo (also called Roo, or collectively TurboRoo), an Indiana Chihuahua who was born without front legs. 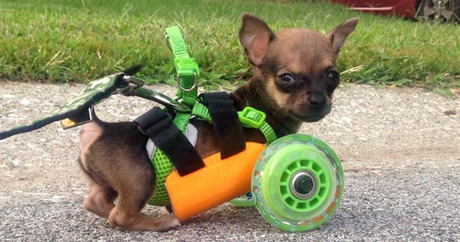 In order for the pooch to have some mobility, personnel at The Downtown Veterinarian in Indianapolis fashioned the pooch a cart made of toy parts. TDV put out a call for donations to cover the $200 needed for a permanent cart. One person who read about TurboRoo’s plight was Mark Deadrick, president and chief engineer or 3dyn — a San Diego-based company that specializes in industrial design. Deadrick did more than send money, however: Working from photographs of the pooch, he created a blueprint using a 3D rendering program and then made a cart using a MakerBot Replicator 3D printer. According to 3DPrint, it took the MakerBot four hours to “print” a cart. After two printed versions, Deadrick was satisfied with the third one version, added a pair of skateboard wheels from a sporting-goods store, and sent it off to TDV. “[Deadrick] in California got in contact with us…and basically told me, ‘I’ve already made it, I spent five hours on it tonight, I shipped it out, and it will be there Thursday,’” Ashley Looper, TurboRoo’s adoptive parent, tells Fox 59. At 6 months of age, TurboRoo should be fully grown. At that time he will get a more permanent set of wheels.